11am - 9pm Sunday through Thursday. 11am - 10pm Friday and Saturday. 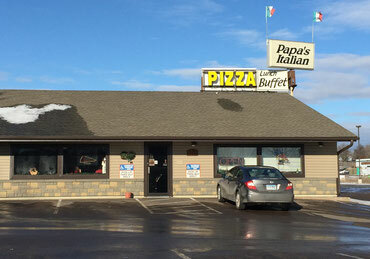 From Highway 169, as you approach Zimmerman at County Road 4, turn West into town and then turn right at the Dairy Queen, go just one block and Papa's Italian is on your left hand side. Watch for our "Pizza" sign on top of our roof. We have a beautiful party room that will make your experience one you won't forget. Whether you're having a birthday party, team party, adult get together, bridal shower, or ladies night out. Our party room is the place for you! Papa's party room seats up to 50 people. There is no charge for the use of the room with food purchase.